IT has been six months now since I started running the roll-your-own advertising service Addiply on my main website This French Life. In a nutshell it offers publishers a chance to put businesses in front of a tightly focussed readership so that the two can meet and hopefully generate a long running connection between the two parties. Here is my explanation to businesses of how to advertise on This French Life, so I won't go into great detail on that side of things, but I thought I'd write a piece on how I am making it work from a publisher's perspective. I have come to realise that the advertising service can be seen as a way to support and connect people, which ultimately benefits my own site, because if everyone ups-sticks and heads out of France my site is snookered. So I have looked at ways to ensure that advertisers get plenty of 'bang for their buck' and offered a price of 50p per 1,000 page views, this lets people pay £10 and their advert will be displayed 20,000 times, which is not a bad deal. Something that I do stress, and which is pretty unique when compared to other competitor sites, is that a business owner's advert will appear on every page of the site (approximately 3,200) - very often people will only have the chance to appear in different sections. And it is with this in mind that I have placed the advertising strip at the top of the right hand column of my site because I know it is a 'hot spot' and so readers will be able to see the services on offer. When I first started using Addiply I of course did not have a vast number of people signed up so the first strip of adverts displayed just three available blocks, and I even opened an advertiser account myself and placed my own advert in there so it appeared populated. There is a bit of psychology at play here, because like a forum without any posts, no one seems willing to go first but with an advert from myself I began to see people take up the option to try it out. Another thing I do is every Friday write a very simple thanks to site advertisers post so that people who read the site via RSS are notified of those businesses helping the site, and I also include a link to the page that highlights how to advertise on the site. One little techie point about this thank you post is that I place a no follow tag around the links to the websites of those companies currently advertising. The only reason I do this is because search engines penalise so-called paid for links, and whilst I can vouch for all the websites that advertise on This French Life and would prefer to offer up a regular link, I don't want to run the risk of being penalised in search engine results. I do think it is worth writing a simple guide to the advertising option as it not only allows browsers of the site to read it, I offer a link to it at the top and bottom of each page, it also lets you quickly send a link across to people who contact you directly. You will also see that on this page I highlight those advertisers who have used the service which act as testimonials. And I wouldn't be afraid to drop a line to people you write about in articles, especially events that are set to take place soon, as often organisers will have a little money set aside for advertising and I would say, impartially of course, that a locally focussed website is the best option. It is still early days in the life of small, online publishers running financially viable operations, but if you begin to see things from the perspective of enabling connections to take place between businesses and readers I really believe the balance is tipping our way. THE wonder of the web can often offer you a glimpse of the future through someone's online creativity, then again it can shoot you back about five years in a click. That's where I travelled when I read a piece about setting up a payment scheme to read the New York Times website. It just starts all wrong by thinking the 20 million unique visitors a month who visit the site will cough up on average $1 a month to read articles, providing a yearly revenue of $240m. To put it blunty, they won't. You'll just end up with a small percentage, maybe just one per cent of the 20 million (based on the one per cent, nine per cent, 90 per cent rule), willing to pay for access, so know you are looking at £2.4m a year. Take off the cost of running the subscription service and the cost of promoting it, plus advertisers wondering where all the readers have gone and you begin to see the holes develop. But many believers in payment barriers point to the Financial Times and Wall Street Journal as examples, they are, but not in the news market they are in the financial information market. Some people are willing to pay a subscription if they can make financial profit, people won't pay to gain 'social profit' from reading articles on the New York Times when there are plenty of other destinations on the web they and their friends can profit from. Let's face it we are not short of articles on the latest from Washington or Westminster, but insight and figures on a range of businesses in a compact and easy-to-profit-from format is something that is niche and of value. Clay Shirky has spent many more hours than myself looking into the world of online micro payments and he deals with the argument for charging to read the New York Times with extreme thoroughness. But if news websites can't charge for content what can they do? Well for a start they could open up their eyes and take a look around the web at sites and individuals who are profiting online, instead of thinking they need to produce 'new' forms of advertising. First off they need to read up and gain experience of what works online, instead of listening to people who claim you can't make money from blogging (via Nigel Barlow), learn and study from those who already are. A couple of quick examples, the first of which is Cheapflights.co.uk who reckon to have 'generated travel product sales of over US$1.8 billion for its advertising partners in 2006' (in notes to editors). Or maybe the individuals who made six figures from Google Adsense or sold just under £5 million of products for companies through affiliate marketing. The common element these three examples have is that they have spent time, energy and to various degrees money to understand and expand their knowledge of generating income online. It is in this direction that thoughts and ideas should be directed, not wasted on, as Clay Shirky describes it, 'nickel and dime' methods of charging people to read news that is ubiquitous, so where to start? I think it is important that journalists see themselves as publishers, not only to bring knowledge to the company they currently work for, but in case they join those who have already been shown the door in recent months. Then break out of the mentality of churning through the same old advertisers that a newspaper sales team always turns to. There is a growing number of businesses out there who are aware they need to do more online, but they need help, support and different means to advertise their services. Look to increase the size of the advertising pie, instead of always choosing the same pie dish. ONE of the things that newspapers have never got their heads around with the move online is that you can't use the same advertising sales techniques as in the paper. A whole different method is required, with some part involving the hand holding of advertisers who may not have used online before, whilst other elements may involve partnerships. Many moons ago when I was working on This is Lancashire, the Fish4 service had real potential to be a basis, it would be called a platform today, upon which many UK businesses and sectors could have gained an online presence. Unfortunately it never moved with the times and has slowly drifted off the radar, and so a new set of people are going to have to be trained up in how to sell online ads if local news organisations want to survive. That is also the belief of Dave Chase, writing from a US perspective, and who has an IT and sales background. I think any online publisher, regardless of size, should take a little time to read over his article and draw a few ideas from it. His first point about 'farming hunters' perfectly sums up what happened with Fish4, the newspaper groups only looked to shift their existing advertisers online as a way to 'lock-in' their share of the advertising pie. And failed to realise that if they had looked to use Fish4 to make a bigger pie then there is a good chance smaller retailers would have had a platform to work off and maybe even given eBay, and other online retailers, a run for their money. It is this closed nature of so-called creative media that struck me as well when I read a piece about the experience of a professional photographer on Flickr. The pros and cons of using the service were explained by photojournalist Pete Jenkins, and he put the emphasis on the cons, but it comes as no surprise he didn't think it worked as he only saw Flickr as a one way process. He wanted to use Flickr as a way to sell prints of his work, which is fine, but shops already exist for that. Flickr, and the myriad other online creative tools out there, are places where you share your work, share ideas, pass on advice and in Flickr's case get involved with the photography community. Want to know how to make Flickr work for you, amateur or pro? Spend some time on the Digital Photography School. Update: Julia writes in detail about her own experiences of Flickr and offers some tips on getting the best from it, see Making Flickr Work for You (Or Not). IF there is one thing I have found difficult to offer readers of This French Life it is a simple advertising option that puts them in control. I've helped a few companies who have services that will appeal to lovers of all things France, but I've only be able to offer plain graphic ads for a flat fee that are not easy to measure or require me to update. So I am hoping that a new service I am promoting on the site will appeal as I believe it is simple to understand, allows people to easily set a budget and gives them the tools to edit their ads whenever they want. I have written up a piece offering advice to business owners who want to advertise on This French Life, so I won't repeat myself here. A VERY thorough, insightful and thought provoking series of articles about why newspapers in the US, as well as those in other post-industrial countries, are struggling. NOW wouldn't life be so much easier if when we went into a shop we picked the price we wanted to pay for something? Oh how I'd love a new mobile phone to play with, here's £5, and as for a new television well here's £20 and if you throw in a smart Sky+ box I'll cough up £25. I will get straight to the point. [website name] is seeking to be the premier web site for "property in france". As part of our marketing strategy we are investing a considerable sum in promoting our web site and/or our logo. We are therefore seeking relevant (on topic) websites for property and life in France such as yours. We are currently offering upto 25e for one year listings (links) from inner pages on your web site (providing they are cached by google and relevant) - to [website address] and 45e for links to us from good quality home pages. There is no catch to our offer and it is straightforward. If you would be interested in listing our web site on a relevant page then please return our email. We are looking for a very diverse set of sites from property to culture to cooking - France being the main topic of the web site. Here is our preferred link and attached is our logo should you wish to use it. We would also equally interested in placing an appropriate link directly in any articles that you may have which are relevant. [website address] title="French Property For Sale"> Property In France For Sale - [website name] is a portal for advertising French properties for sale. So they are kindly offering me between £20 and £35 a year to feature a link on my site which has been established for more than four years, has the best part of 3,000 pages and is updated every day - where do I sign up? And I won't even tell you about the established cross Channel ferry firm who wanted me to promote their service but didn't want to advertise because 'the association with our recognised brand name and benefit to your customers will be enough'. YESTERDAY'S meeting of the Digital Editor's Network and the Journalism Leader’s Forum in Preston has produced a collection of comments and articles, which I suppose comes as no surprise considering we were talking about "money". I think most people realised that there was little chance of getting to the heart of how media companies make their online ventures bring the cash in, but personally I wasn't expecting to be chatting with people about issues that I was dealing with five or more years ago. 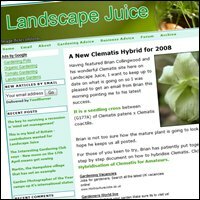 ONE of the first people I got up and running with a blog driven website was Phil Voice who started one for his holiday home in France, but has taken what he learnt from this to establish Landscape Juice. Before crossing the Channel he ran a successful landscaping business in southern England and using his blog he's been able to establish his site as the "go to" blog style site for his industry. His articles offer advice on all things landscaping, but also tips on running a landscape business and making a success of things during both the good and bad times. 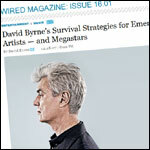 Where there was one, now there are six: Six possible music distribution models, ranging from one in which the artist is pretty much hands-off to one where the artist does nearly everything. Not surprisingly, the more involved the artist is, the more he or she can often make per unit sold. The totally DIY model is certainly not for everyone — but that's the point. Now there's choice. Although aimed at musicians it is the opportunities that now exist for any artist which are important to consider, as well as the value of copyright and ultimately control over your own direction. THE view from Canada about the difficulties of earning a living from writing for magazines as budgets are squeezed and the use of the interent grows (via). My strongest evidence that serious Canadian magazines are simply no longer plausible, except as hobbies or charities, comes from conversations with writers.